Wow, finally received the chance to have a good dram of the Glengoyne 25 Year Old whisky. We visited Glengoyne distillery not too long ago and managed to bag a plethora of their bottlings including the Cask Strength and Teapot Dram Batch #2 as well as have a fantastic time there! So this is their latest ‘premium’ expression. To put this into perspective I took a look at other premium whiskies currently available in the £250 price range, excluding rare malts/closed distilleries etc. and came up with the list of Glencadam or Glenglassaugh 30 Year Old, or Glenmorangie or Glenfarclas 25 Year Old. Of these I have tried the Glenglassaugh and was of the impression it was equally as good as this Glengoyne 25 Year Old. In the end I decided I would need £1250 to buy them all! 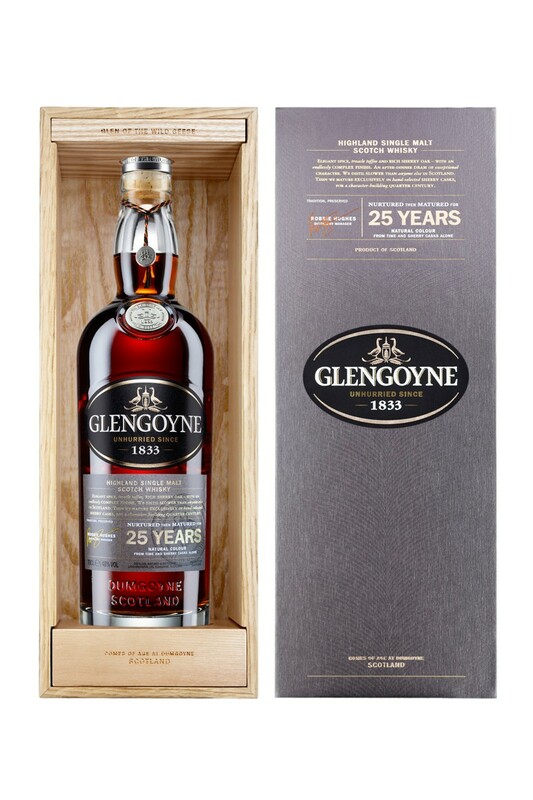 In actuality, no I am unlikely ever to buy a whisky at £250 a bottle, however if like me you have an affinity for Glengoyne, love sherried whiskies or old woody whiskies and do have that kind of money to spend – then I don’t think you would be disappointed with this 25 year old expression. Beautifully constructed, this is a whisky that needs an open fire, a deep leather armchair and plenty of time to mull over it. What’s your opinion about the big jump in price from the Glengoyne 21 (less than £100) to the 25 (£250)? Joking aside, I have tried the 21 and it is good and the difference in taste between that and this 25YO is possibly bigger than the 4 years and extra 5% ABV would suggest. This appears not to be a limited or numbered bottling and Glengoyne give no details of cask numbers, distillation date or number of bottles produced, only that this is the 1st and 2014 bottling of the 25YO – so it’s not really collectable, and is not likely to be bought for auction as it is a new addition to their core range and should be available for the foreseeable future. I really honestly don’t know where or who this is marketed to?